The Delhi High Court, speaking through Justice Manmohan, has directed the authorities to strictly enforce the law for registration of e-rickshaws plying on roads in the national capital. The petitioner, BSES, had sought a direction to the respondents to take steps, make arrangements and effect measures for expeditious creation/setting up of arrangements and necessary infrastructure for charging of e-rickshaws plying in the petitioner’s area of supply in the NCT of Delhi. The single judge directed the state transport authority along with Delhi Police to frame a comprehensive policy with regard to e-rickshaws. It held that the intent of the policy should be to ensure that only registered e-rickshaws ply on the roads after payment of registration and insurance policy charges. The state transport authority and Delhi Police would also have to now consider the that the number of e-rickshaws should be capped, keeping in view of the carrying capacity of the Delhi roads. It was further directed that seized e-rickshaws shall be released after their owners obtain and produce a registration certificate. It was also directed that if any complaint is filed by any of the discoms with regard to the theft of electricity by e-rickshaws, the same shall be properly investigated by the Delhi Police in accordance with law. The high court's fresh directive has come in the wake of reports that e-rickshaws are still plying on the roads without having proper registration in the national capital. Till now, e-rickshaws are released after being impounded after the owner gives an undertaking that he will not violate the law in future. 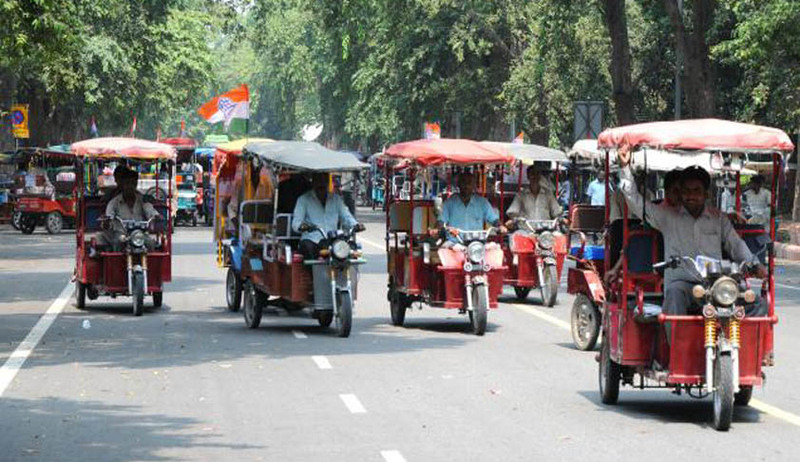 There are approximately one lakh e-rickshaws in Delhi, of which only about 15,000 have due registration. The rest are plying on the roads without registration. This important ruling, will now not allow authorities to release the e-rickshaws impounded until it is brought in the conformity with the Motor Vehicles Act, 1988. Earlier, e-rickshaws were not required to follow the Motor Vehicles Act. But, the government brought these rickshaws under the ambit of the Motor Vehicles Act making it mandatory for the owners to fulfill all those conditions as required for the taxis and autorickshaws. Prior to government's decision, if someone met an accident due to rash or negligent driving of an e-rickshaw, the victim was not entitled for any claim as it required registration of the vehicle under the laws. Without having registration under the Motor Vehicles Act, insurance of e-rickshaws was not possible. According to reports, most of the e-rickshaw drivers don't have a driving licence. This makes the high court ruling very significant.